Fellow fans of TERMINATOR: THE SARAH CONNOR CHRONICLES will enjoy showrunner Josh Friedman’s latest blog post at the TSCC wiki, in which he points out that last Monday's ep “The Demon Hand” was penned by former BATTLESTAR GALACTICA writer Toni Graphia. An interesting fact given that this particular episode touches on so many themes that also run through BSG. MovieWeb: In the last episode, with Summer doing ballet, are we heading to a point where the Terminator's are going to be more like Cylons, and are going to have more emotional stuff going on? Because it seemed like there was a hint of that. Josh Friedman: First of all, I would argue, with all due respect to Ron Moore, that Cylons have wanted to be like Terminator's for many years. Probably all of them wanted to be like Blade Runner. [Cameron is] a more advanced model, and she has more ability to, at least, mimic emotions and do some things. I think that whenever you have a form of cyborg, android, whatever, there's always a temptation by the writers to start exploring that humanly thing, how far it goes and what our limitations are. It's something that I'm still exploring. It's interesting because I think there are two groups of people who watch these shows. There are the real sci-fi people who watch these shows, and then there's everybody else. The everybody else, has probably never seen Battlestar Galactica, so they're all fascinated by it…When I was writing this show, I would not watch Battlestar Galactica. Honestly, I had to avoid Battlestar Galactica for a year because I couldn't handle... they do those things so well, and I really wanted to go off on my own and not think about it. SPACE producer Mark Askwith confirmed on the Spacecast boards today, that BSG will be airing in Canada concurrently with the Sci Fi Channel in the USA. So don’t worry Canuck fandom: we Americans will not be able to spoil you! 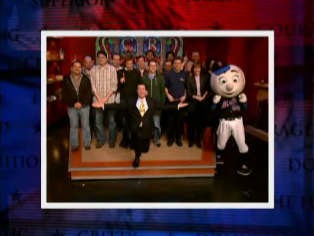 A little birdy is telling BSG fans that they should watch The Late Show With David Letterman on Wednesday, March 19th. Apparently there will be something that we will enjoy. Jamie Bamber and James Callis have just been announced on the Dragon Con guest list. If everyone actually shows up, this brings the total of Battlestar Galactica cast attending to six including the previously announced guests Leah Cairns, Aaron Douglas, Richard Hatch, and Tahmoh Penikett. io9 has posted the rest of the Battlestar Galactica season 4 clips that leaked online earlier this week. In case you missed it, most of the leaked clips are here. Interestingly, no one is asking io9 to take them down. IMDB has posted a wonderful Battlestar Galactica Show Recap video, that covers the entire series from Mini to end of Season 3, and it's snarky good fun. 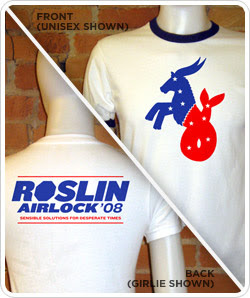 Plus it gets kudos from this fan, for so carefully tracking my two favorite 'ships: Starbuck/Apollo, and Roslin/Airlock. Heh heh. All in all, a fun way to convince someone they need to catch up by April 4th. ETA: Fandom, being the obsessed lovefest that it is, has put the recap on youtube - and has realized that the narrator is the same person who voiced the 8-minute LOST Recap du snark video released before S4. You can also see the BSG Recap on SciFi Pulse. io9 has cut together and posted most of the BATTLESTAR GALACTICA season 4 clips that surfaced online earlier this week. They are sort of spoilery - although each one is less than 30 seconds long, so you cannot really get a grip on any big plotlines. That last one is MY DREAM COME TRUE. Thank you Ron Moore and The Writers Room. Hurry over there, who knows when NBC might drop the hammer and yank it. * Spoilers in this clip for this week's new LOST season 4 ep. Natch. A while back, I asked that anyone who spotted Katee Sackhoff and Tricia Helfer out for a ride on their motorcycles in LA or Vancouver, would really, really have to send us some photos. No need for that anymore: Tricia herself has posted a bunch of shots of a recent trip with Sackhoff and others, enjoying their bikes and wine in Santa Barbara Wine Country. This is the lovely area of central California where the film SIDEWAYS was shot, and I highly recommend visiting. Here's a SIDEWAYS tour map PDF if you are interested. Life is absurd. Be merry. Be free. Battlestar blog has posted the fanterview their membership did with Kandyse McClure ("Dualla"). McClure answered a ton of fans' questions. You can keep updated on her work by subscribing to her official site. Bear McCreary has an update on the upcoming Battlestar Galactica concert event now planned for mid-April. This year’s show will eclipse the 2006 event in every way. We’ll have a larger band, playing music from all four seasons of Battlestar Galactica, more taikos, more strings and more soloists in the group. We’re also producing an all-new video presentation / documentary which will premiere at the concert. And there are some very special guests coming too. That’s all I can say at the moment, and of course, nothing is official for another couple weeks. But, hopefully we’ll see you there! Pop Media Cult has updated their ongoing list of known BSG season 4 spoilers and speculations culled from many sites, publications and articles. Grant Gould posted a ton of great photos from Cool Toy Review of upcoming BSG figures from Diamond Select Toys shown at the Toy Fair 2008. They have several items from Razor, such as figures of Admiral Cain, and young Lt. Billy Adama. Watching BSG reports on an upcoming film with Tricia Helfer called Spiral. Starting this month NBC Digital Entertainment and NBC Universal Cable Entertainment will be streaming their vintage series including episodes of the original Battlestar Galactica on NBC.com and Sci-Fi.com and other NBC/Universal websites. Mark Verheiden reports that the WGA membership has approved the new contract. United Hollywood has more. Today, it is our pleasure to inform you that members of the Writers Guilds of America, East and West, have voted to ratify the MBA contract with 93.6% approval. With a total of 4,060 votes cast, the tally was 3,802 to 258. These numbers reaffirm the tremendous level of support and commitment our membership has continuously demonstrated over these last few crucial months. I guess Harlan Ellison was among the 258. For those of you who subscribe to Sci Fi Magazine: keep an eye out for a BATTLESTAR GALACTICA season 4 preview piece in the April issue (cover photo above). Sci Fi Channel and DirecTV have created a site, Visions For Tomorrow, where you can vote on their poll of "Top Things to Read, Watch, See, and Do to Save The World," until March 31. BSG is a choice under TV to Watch. io9 attended a recent talk given by video game designer and visionary Will Wright, inventor of Sim City and The Sims. Wright apparently used BSG and Cylons in his discussions of Sci Fi, transmedia storytelling and the future of the user/ viewer/ gamer experience. Sounds cool – check out the slide gallery they posted (see below). Meanwhile, software coders are using Cylon analogies at their security conferences...and aca-fan bloggers such as Queer Geek Theory ponder even more complicated Cylon metaphors. Following the recent news that BSG will continue to produce eps and finish with its original full order for season 4, Crave Online ponders what many “message board pundits” have been discussing for a while now: will the rag tag fleet find Earth…and has Ron Moore already figured out his end game? The Battlestar Wiki Blog is holding a fandom raffle to giveaway copies of the BSG season 3 DVD set, the season 3 soundtrack CD, and a one year membership to their forum. All you have to do is fill out a survey to enter. Which means it might help to also have an opinion. It started in the mid-late 1990s with HBO's original series, especially THE SOPRANOS in 1999. This revolution in television - frank, gritty, real, intellectually sophisticated - soon spread to other cable and old-fashioned network television. In the past few years, science fiction has taken a leading role. In this special podcast - based on a lecture I gave to the Philadelphia Science Fiction Society on 25 January 2008 - I look at the contributions of five science fiction series to this new golden age of television ... LOST, TERMINATOR: THE SARAH CONNOR CHRONICLES, JOURNEYMAN, BATTLESTAR GALACTICA, and HEROES. Four BSG characters are included on this blogger’s list of the 20 Most Incredible Sci Fi Women. Artist VectorGeek is working on some neat stuff including desktop wallpapers and viper squadron patches. Sci Fi Weekly takes a look at Hasbro’s BSG Titanium series miniature ship replicas (per above photo). For starters, the Battlestar Galactica line is expanding with a fourth series of Minimates as well as a line of Minis based on the classic Galactica series. Yes, that includes a Muffit Mini. Series 2 of Diamond's Galactica action figures hits in June, featuring Starbuck, Kat, a Cylon Centurion, and exclusives of Helo and Cain. And busts and statues of characters and ships from the series are also in production. The Comic Book Bin has information on the next issue of the BSG comic BATTLESTAR GALACTICA: SEASON ZERO #10, which will be out in April. Now you too, can get your own personalized Viper Pilots license – just buy one on eBay (WARNING: Lee Adama does not approve of frakking shortcuts). Hat tip to io9. Concurring Opinions has released part 3 of their 4-part interview with Ron Moore and David Eick. Galactica Quorum has posted an interview with James Callis from the Farpoint Con last week. The great blog All About Tahmoh Penikett has material from recent Penikett interviews in Starburst magazine and People Uncut. Tricia Helfer’s official site has posted the video from Helfer’s recent stint on The Late Late Show with Craig Ferguson. Tricia Helfer Fan has a link to Helfer’s recent appearance on Canadian version of MTV Cribs at her Los Angeles home. The Sci Fi Guys recently aired an interview with Aaron Douglas; The Chief’s Deck has cut their audio file down to just Aaron’s part. In Con news, Aaron Douglas has joined the list of BSG cast attending this year’s Dragon Con in August. Tahmoh Penikett, Aaron Douglas and Richard Hatch will attend The Wrath of Con in May. Via Galactica Water Cooler comes more details on the ALIENS: COLONIAL MARINES video game, with a plot written by Battlestar Galactica writer/producers David Weddle and Bradley Thompson. Screen grabs of game play can be found here. I just discovered the news feed blog for a (new?) SF&F cable channel called Illusion. Does anyone have this station or watch it? They keep mentioning great Battlestar Galactica interviews in print-only magazines. If any of you can get your hands on these and share, let us know…including Mark Sheppard and Katee Sackhoff in SFX, and David Weddle & Bradley Thompson in Cult Times. Lucy Lawless gave her voice to two animated films that have just been released on DVD. DRAGONLANCE features the voices of Lawless, Keifer Sutherland, Michelle Trachtenberg and Michael Rosenbaum. JUSTICE LEAGUE: THE NEW FRONTIER, with Lawless voicing Wonder Woman, may have the TV-geek-coolest voice casting I’ve ever seen: David Boreanaz, Brooke Shields, Neil Patrick Harris, Miguel Ferrer, Kyra Sedgwick, Jeremy Sisto and Kyle MacLachlan! My gods, that's good. Via the Juicy Flawless website, here are a few JLTNF clips: the film's creators discuss Wonder Woman's origins, and a scene from the film featuring Wonder Woman and Superman (MacLachlan). Favreau is known for disliking CGI and only using it when necessary, which is both good and bad. 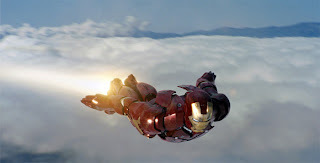 In IRON MAN, he found a balance between using the two. "The action is a set piece, so it has to propel the story… In this case it's a fight, it's action, it has to do something metaphorically, right?" "Because there was so much CG, I didn't want to just have virtual cameras flying around. And so we found a great practical air-to-air film, like TOP GUN, and we said this was all real, this was before CGI - how did they film it? What did they have to do? These long lenses… And then you looked at the making of it, there's a look. It looks different than STEALTH. STEALTH, the camera does this, it does this, it's got a short lens, it frames everything perfectly, and it goes for a different aesthetic, it goes to be speculator. In TOP GUN, they're trying to line the two planes up, it's so hard to keep them both in frame. Sometimes it buzzes…"
"Who does it good? BATTLESTAR GALACTICA, the TV series. They do it very well. It's very charming what they do. They'll admit, they miss, they zoom, they rack, it's almost becoming a motif in that, like the shaky camera on NYPD BLUE, but it's there. It's like, look at this, why is this cool? It should look like an air show. When something blows up, you zoom in and miss it, you try and get it. It looks like a YouTube video. And then it becomes about, okay, here are the rules." Frak me, this video never gets tired. Video intro to last year's Comic Con panel "The Ladies of Battlestar"...also fun to watch again: Sci Fi Channel's full video of the panel with Mary McDonnell, Tricia Helfer, Katee Sackhoff, Lucy Lawless, David Eick and Ron Moore. 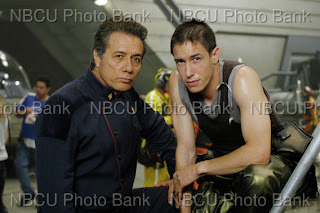 Happy Birthday to Edward James Olmos today...and congratulations for his nomination for this year's Saturn Award as Best Actor on Television for his performance on Battlestar Galactica. Mr. Olmos has joined musician Carlos Santana and actor Martin Sheen as National Co-Chairs of the effort to win a national holiday honoring the birthday of Cesar Chavez. Rumors are leaking out now from Vancouver Film Studios that Battlestar Galactica production may resume there by March 24. According to a fan who spoke to some of the BSG writers earlier this week, Season 4 will most likely wrap by the end of May or early June, and Ron Moore is directing the first episode out of the gate when the show goes back into production (you can read more about this mildly spoilery chat here at my livejournal). This will mark RDM's first time in the Director's chair. Also this week, while Remote Access blog pondered the meaning of the title to the first episode of Season 4, “He That Believeth in Me,” a press release hit the grid announcing that DOCTOR WHO and spinoff THE SARAH JANE ADVENTURES will be joining BSG on SciFi Fridays this spring. Official word about international Season 4 air dates has not been received yet…but a skiffy forum poster says they’ve heard the show will begin airing in the UK on April 8 on Sky One. There is apparently still no word on when the Canadian start date is for Space Channel. The 13th Colony is already discussing upcoming visits to public shooting locations around Vancouver this summer. The site plans to post more location updates, maps and info. The always enlightening livejournalist dianora2 has written up her two squee-filled days with James Callis at Farpoint Con last week. Here’s Saturday and Sunday. Off Topic convention post of the day: via ohnotheydidnt comes news from the Wondercon X-FILES panel...And (quick or you'll miss it!) the TRAILER. Look closely and you'll see Callum Keith Rennie for a moment. 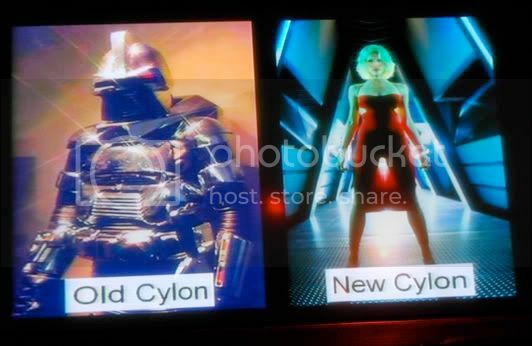 All these fantastic new season 4 photos have me jonesing for my BSG this weekend. While some Battlestar Galactica fans love to feed their hunger by OD'ing on spoilers (or what they think are spoilers), I prefer to surround myself with the sweet slanket of Fandom. Creative, informative, opinionated and persistent! Take fanvids, ferinstance. Here are a few on my radar this week. Also, Ryan has an excellent overview of the new HBO series, In Treatment that co-stars Michelle Forbes. Ryan noted that much of Forbes' work on In Treatment was filmed at the same time she was also working on Battlestar Galactica: Razor which had to have made for an interesting acting challenge. Part I, available today in two files, focuses on the issues of legal systems and morality. It examines the lawyers and trials in the show. It also examines how torture is depicted, as well as how the humans must balance civil liberties and security. Part II examines politics and commerce. It explores how the cylon attack affected the humans' political system, and it examines how commerce works in the fleet. Part III examines issues related to cylons, such as the humans' treatment of cylons, how robots should be treated by the law, how the cylons govern themselves politically. Additionally, Part III will explore the religious issues involved in the show. ...we plan to post Part II on Monday and Part III on Tuesday. So please stay tuned. More is on the way, and Parts II and III are really terrific! These are .WAV audio files for download or stream. Apparently the law profession (especially the professors) love them some BSG. Without press credentials all you will see are the thumbnails, but the NBC publicity department has posted Battlestar Galactica Season 4 promo photos online. ETA: just nabbed two of the high res shots, below. Click them to see larger versions. ETA 2: We have been asked to remove all promo photos and links from this post. Fair enough. Suffice it to say to fandom now, that "the truth is out there." ETA 3: You can still see the photos elsewhere...including on Mo Ryan's blog, IGN, Cinema Blend, AfterEllen, io9, and BuddyTV. We'll see how long that lasts. “While Universal values the close partnership we have shared with Toshiba, it is time to turn our focus to releasing new and catalog titles on Blu-ray,” said Craig Kornblau, president of Universal Studios Home Entertainment. Battlestar Galactica should look great on Blu-ray. Australian TV channel TEN has updated their Battlestar Galactica video interview page a bit more with new video of Jamie Bamber, Michael Hogan, Mary McDonnell and Kandyse McClure. Meshel73 has details and frame grabs here at the battlestar blog. Like the other videos there, these were taped during season 3 and are about topics from 3.0 episodes. Several eagle-eyed fans have noticed that the official Battlestar Galactica Season 3 DVD web site has been updated. It now has Season 3 deleted scenes, and a game that will unlock additional scenes. Apparently the ones in the game will NOT be on the DVD set - so here's your chance to see them. Harlan Ellison dissents and recommends writers vote NO on the new WGA contract. Interestingly, in the comments to his post on United Hollywood a lot of writers seem to agree with him. We'll find out, when the results of the contract ratification vote are revealed if this is a minority report. BSG co-exec producer Mark Verheiden voted aye on the contact. The lucky folks at livejournal's battlestar blog have scored yet another fanterview with BSG Cast. In addition to Leah "Racetrack" Cairns, members of this LJ community can now submit questions for Kandyse "Dualla" McClure. Deadline for the Cairns interview is TONIGHT, and for the McClure interview is TOMORROW. Again: you need to set up a (free) membership on livejournal, and then join this LJ community, in order to submit your question. Animation lip sync test from amazingactionape. A Galactica Sitrep reader, Danielle, sends word from France that Battlestar Galactica is set to go back into production in late March in Vancouver, B.C. Thanks Danielle, for the tip. 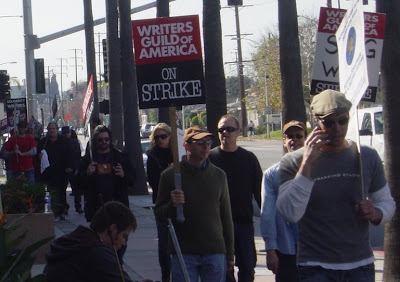 With the strike over, Jane Espenson reports on her blog about being back in the writers' room. Pop Candy had an excellent interview with Jane awhile back. And check out this essay by Nathon Fillion from Serenity Found, a book of essays on Joss Whedon's Serenity that was edited by Jane Espenson. Tricia Helfer Fan dot com has a few spoilers relating to variations of Six. But if you want MAJOR HUGE SPOILERS just check out this article on io9. Don't say you weren't warned. Do Not Click that link unless you want to be really, really spoiled. Seriously, you'll be happier waiting just 47 more days till the season 4 debut. We've waited this long, we can surely wait another 47 days. In other news, Margie at Watching BSG has photos of Katee Sackhoff attending a movie premiere. And Michelle on the Battlestar Blog posted some great photos of the Diamond Select Razor Minimates. Lastly, following up on my Blu-ray disc report below, Reuters and the Digital Bits are reporting that HD DVD manufacturer, Toshiba, is announcing that they will no longer make HD DVD players. Game over. The hi-def disc format war is finally over. Digital Bits editor Bill Hunt says that it may take longer for NBC/Universal to transition to Blu-ray disc, "as they're at least two years behind the other Hollywood studios in working with the format (though one would expect the BDA to provide them help in getting up to speed as quickly as possible)." Thus it might take them longer to release Battlestar Galactica on Blu-ray than I thought. However, BSG is probably one of their better selling titles on DVD so it may be a priority for them. We'll keep an eye out for any news on the subject. With Toshiba's move to exit the HD DVD business, Paramount and Universal will probably announce their support for Blu-ray disc within days. In a comment to the previous post, anonymous posted a link to this hilarous YouTube video making fun of HDDVD's demise. Thanks for that link, anonymous. 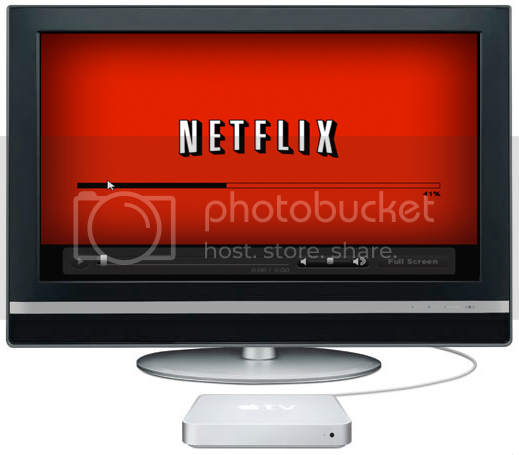 Blu-ray disc has won the battle for the format of high-definition video. The New York Times, and Deadline Hollywood Daily report that Wal-Mart has chosen to move to selling only Blu-ray discs. Their move follows similar moves by Best Buy, and other major retailers and movie rental providers like Blockbuster and Netflix. There's no way HDDVD can survive this blow. "We've listened to our customers, who are showing a clear preference toward Blu-ray products and movies with their purchases,'' Gary Severson, head of home entertainment for Wal-Mart's U.S. stores, said in a statement. Wal-Mart said it will phase out all HD DVD offerings by June. The hi-def war is over. I would expect that the two remaining movie studios that are HDDVD exclusive, Paramount and Universal, will reverse their position soon. So, expect hi-def versions of Battlestar Galactica to be released on Blu-ray in the not too distant future. Just a guess here, but BSG coming out on Blu-ray by Christmas makes sense to me. ...and it felt like we'd been gone maybe, oh, twenty minutes. Or maybe a long lunch. Phones and computers had been turned off, but the offices were the same and the writer's room was still festooned with cards and white-board notes from where we left off. Weren't the writing Gods (or would that be the monotheist "God") supposed to come in and get everything in shape while we were gone? 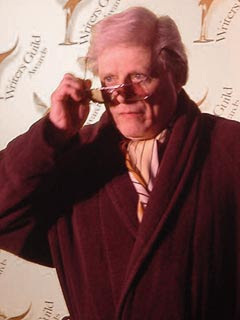 As the wonderful Terry (Mrs. Ron) Moore explained over at Galactica Sitrep, the staff just watched all eleven new episodes back and back, and while I am, of course, biased, I think viewers are going to be riveted by what's coming up. Season four/the last is a roller coaster/gut-punch from start to finish, with some of the rawest emotional moments yet, from characters you may not expect. Plus space battles! It all starts April 4. Pen it in! It is official. The BSG writing staff spent their day yesterday working on the rest of the season. They're back. Impeccable sources tell me that Battlestar Galactica's fourth season, put on hold for three months by the just-ended writer's strike, will not be truncated. The SciFi Channel has told Ron Moore that they want to complete the entire 22 episode season four order! The network will be giving Ron Moore, David Eick and their embarrassingly good writing staff a lot of hours to wrap up the show's story without rushing or trimming. When the show shut down three months ago, there were some worries as to whether it would start up again. Battlestar is expensive, and other expensive shows that weren't burning up the ratings found themselves axed during the strike. Getting BSG a 22 episode fourth season order was seen as nothing short of miraculous at the time, so people wondered if SciFi wouldn't just 'cut their losses' (in their shortsighted eyes) and end the season at the 12 or so episodes in the can, maybe giving Moore et al the chance to finish everything up in a TV movie. Thankfully that didn't happen, and there's more good news: the entire writing staff is back. They gathered this week to rewatch the completed season four episodes to get back up to speed, and now that the strike is completely and officially over, they'll be revisiting the outlines of future episodes and break those stories. There are still some details that will need to be ironed out - actor's deals may need to be renegotiated to get them secured past when their season four contracts end, for example - but the sets in Vancouver were never struck and the behind the camera types are raring to go and finish their epic story. I've heard that the show is firing on all cylinders in the season four episodes filmed to date, and I hope that three months away has given everybody new energy and perspectives to match the first half of the season. The one mystery that remains is how SciFi will air the final season. Currently the feeling is that they'll split it in half and we'll only get ten or eleven episodes now, with the rest following as late as 2009. Here's to hoping that they wise up and give us the complete story in a more reasonable time frame. We've gotten word from multiple trusted sources (giving us this info separately from each other), that Universal Studios Home Entertainment has decided to release Battlestar Galactica - Season 4.0 late this year. Very late, is the indication (but no date has been finalized, as far as we know). As before, we expect it to be timed for release before the broadcast premiere of the second half of the season, to maximize sales. The "4.0" package will contain the episodes that have already aired by that time, with the final episodes eventually getting released on a "Season 4.5" set down the road...probably in 2009. The Livejournal Battlestar Blog has opened up the floor to its members to submit questions for their interview with castmember Leah "Racetrack" Cairns. Deadline to submit is next Monday and, yes, you need to start an LJ account and join that community to send in a question. Better late than never: congrats to Gary Hutzel and his crackerjack BATTLESTAR GALACTICA special effects team (Mike Gibson, Sean Jackson and Pierre Drolet) for getting the most Visual Effects Society Award nominations in TV this year, and for winning one this past weekend. BSG won Best Visual Effects in a Broadcast Miniseries, Movie or Special for BSG: RAZOR. Pencils Up, the Strike is Over! Writing can resume immediately. If you were employed when the strike began, you should plan to report to work on Wednesday. If you’re not employed at an office or other work site, call or e-mail your employer that you are resuming work. If you have been told not to report to work or resume your services, we recommend that you still notify your employer in writing of your availability to do so. Questions concerning return-to-work issues should be directed to the WGAW legal department at 323.782.4521 or the WGAE’s assistant executive director Ann Toback at 212-767-7823. The contract still needs to be ratified, but barring some sort of disaster that's pretty much a done deal. So it's over. It's interesting; making a living as a writer in the film and television business is nerve-wracking almost by definition, but the strike was a different sort of stress. For one things, most writers are sole proprietors, used to making business decisions for themselves. To hand the reins over to others (even the crack WGA negotiating team) is inherently frustrating. Also, like most writers I'm used to working under deadline, aiming toward a due date. Strikes don't work that way. Still, it's amazing how fast and yet how slow one hundred days can pass. And it's even more amazing what the collective, determined will of a group of like-minded folks can achieve. We now return you to our regular blog, dealing with my various projects, obsessions and interests. Hey, how about that Springsteen tour? And remember, Battlestar Galactica season four returns on April 4th! Fans4Writers deserves so much credit for organizing fan communities online. The studios mocked the Fan Days and the Pencils, but the public's unwavering support for the writers (as shown in all the opinion polls) at the very least helped strengthen the WGA's hand. One more convention has updated its guest lists for 2008: Atlanta, Georgia's Dragon Con (August) is including Battlestar Galactica cast Leah Cairns, Richard Hatch, and Tahmoh Penikett as guests. 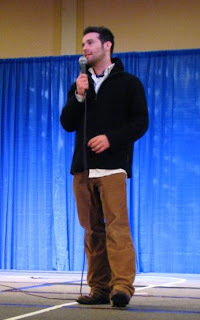 The unique and elusive Mr. James Callis makes a rare appearance at the Farpoint con near Baltimore this weekend. San Francisco’s Wondercon has released their full programming schedule for later this month. Representing for BATTLESTAR GALACTICA is Richard Hatch at 1:30pm on Friday (OT: other exciting guests include James McAvoy and J. Michael Straczynski on Friday; David Duchovny, Gillian Anderson, Chris Carter, Jon Favreau, the cast/crew of ‘Harold & Kumar Escape from Guantanamo Bay’, J. Michael Straczynski again, Douglas Wolk, Andrew Stanton, Steve Carell and Anne Hathaway on Saturday; and Tim Sale, Summer Glau and Thomas Dekker on Sunday; pretty impressive). Via the fan community Mary McAwesome comes news that Mary McDonnell has been added to the BSG guest list at Fed Con in Germany. She joins previously confirmed cast Jamie Bamber, Richard Hatch, Nicki Clyne, Leah Cairns, Mark Sheppard, and Steve Bacic (Colonel Jurgen Belzen, Pegasus' original XO in BSG: RAZOR). Nicki Clyne has been added as a guest at the Serenity Complete Con in England, joining BSG castmates Jamie Bamber and Mark Sheppard. All this – plus Summer Glau, Adam Baldwin and Alan Tudyk. Good times. Grace Park will be at Creation’s Grand Slam Summit in Burbank California, along with a varied guest list that currently includes Zachary Quinto, Leonard Nimoy and Thomas Dekker. This year’s London Expo has announced Edward James Olmos as their guest. The Orlando Sci-Fi Expo guest list has recently been updated and two more BSG cast are attending, bringing total now to Edward James Olmos, Bodie Olmos, and Tricia Helfer. Hot dog! What We're Hearing: The crown jewel of the Sci Fi Channel should finish out its fourth and final season, but per writer Jane Espenson, it's almost certain that, schedule-wise, the story will be split into two separate miniseasons. The show completed 14 episodes before the strike hit, and at least the first 10 will air beginning Apr. 4. The second batch could premiere in the fall or even sometime in 2009. As for Jason Katims' other series, Bionic Woman, well, let's just say it's been hit by a truck and won't be coming back from the dead with new, fancy parts. Ever. Not a big surprise. Goodbye, spendidly evil Katee Sackhoff! We hardly knew ye…For anyone who did like this show, or the good parts thereof, the DVD is coming out March 18th. Same date as BSG S3. Sci Fi Department on AMC unfortunately lost their appointment with Ron Moore to ask all our fan questions. Maybe later. 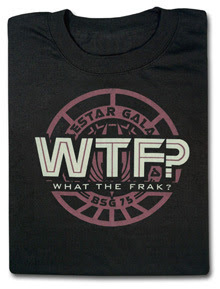 A few great new BSG tees and hoodies available this month from Glarkware and ThinkGeek. BSG has charted at #6 on The Onion A.V. Clubs list of the 20 Pop-Culture Obsessions Geekier Than Monty Python. (Hey, since when is Monty Python fandom geeky? *g*) We’re in good company on this one folks – right up there with Fantasy Sports leagues, Renaissance Faires and Michael Jackson. Kandyse McClure recently updated her blog, discussing how she’s used the strike hiatus to delve into teaching yoga, amongst other things. Here is BSG writer Jane Espenson’s essay for the Why We Write project. An idea whose time has come: livejournalist picturegames imagines Tricia Helfer as Catwoman in Christopher Nolan’s DARK KNIGHT series with Christian Bale. Righteous. Blogger Elver Loho ponders why TV writing can be so much better than film writing nowadays. (Can it? )…meanwhile, The LA Times ponders the same question from a different angle: are certain types of (misanthropic and/or seriously complicated) characters, and their rich backstories, only worth creating for the longer format of a TV series? The Bygone Bureau gives advice about how to watch entire First Season of BSG in one sitting. Always a fun project. Another fan hobby of mine that never gets tired: reading a new “how I discovered BSG and had my mind blown by its excellence” blog post. Here’s a new well-written one, by a blogger for Eos Books, that is very useful if you’re trying to convert a friend. They even include tons of press quotes. 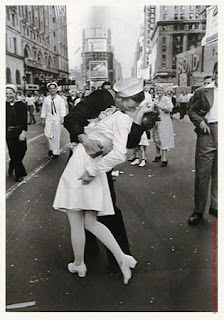 The strike is over. At least unofficially. 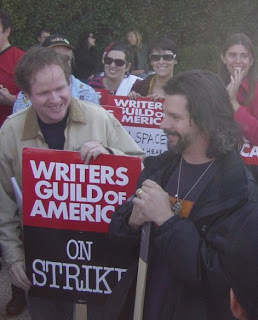 Showrunners like Ron Moore can report back to work on Monday. The members of the WGA will vote on Tuesday to officially end the strike, and once that vote is made public, they will return to work on Wednesday. But, all picketing is now over. We congratulate the writers on this victory, and the Galactica Sitrep is proud to have been involved among the many fan websites and blogs supporting the writers. It's Sunday morning and here's a strike update. The WGA membership meetings yesterday on both coasts were well attended and an outline of the deal terms was presented and questions answered by the negotiating committee. There will be a vote soon across the WGA to accept or reject the deal. 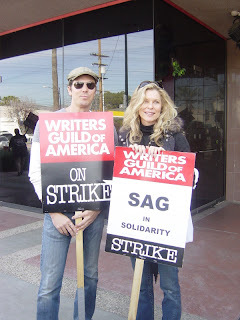 Nikki Finke notes that if the membership votes to take this deal, picketing will end and writers may be back to work as early as this Wednesday. Mr. Moore has not made any new post on his blog, though Battlestar Galactica writers Mark Verheiden and Jane Espenson seem satisfied. EUREKA writer Charlie Craig has noticed that cable writers get a worse deal than network ones. More links on the strike here from Mo Ryan this morning, including the opinions of several other writer/bloggers. United Hollywood posted this thoughtful debate, Pro and Con about the streaming window terms. Though I certainly want the writers to get everything they can from this deal, I have to say the PRO arguement here is much stronger. Let's just look at BSG for one moment as an example - more than half the fans I know of this show, caught up with at least S1, if not S2, via long-window access (ie, seeing it many months, even years, after that first broadcast window ended). Let's not even talk about people I know who admire Joss Whedon shows - there seems to be an entire new GENERATION of Joss fandom that has developed around the DVD releases. The CON standpoint, which uses "appointment" TV shows like LOST as their main evidence, doesn't seem valid for the majority of film and TV. Most people I know catch up with things after the first airing (or with films, after opening weekend), once they've heard enough positive word of mouth amongst their friends, trusted critics, etc. WGA NegComm: "We have a tentative deal." This was sent early this morning to membership. The delay in publishing the deal points, we've learned, was because the companies dragged their feet enshrining some of the final details in an attempt to renege on some of what they had promised. The last-minute fight to keep that from happening took until late last night. We have a tentative deal. It is an agreement that protects a future in which the Internet becomes the primary means of both content creation and delivery. It creates formulas for revenue-based residuals in new media, provides access to deals and financial data to help us evaluate and enforce those formulas, and establishes the principle that, "When they get paid, we get paid." Specific terms of the agreement are described in the summary at the following link - http://www.wga.org/contract_07/wga_tent_summary.pdf - and will be further discussed at our Saturday membership meetings on both coasts. At those meetings we will also discuss how we will proceed regarding ratification of this agreement and lifting the restraining order that ends the strike. Details of the Los Angeles meeting can be found at http://www.wga.org/subpage_member.aspx?id=2763. Less than six months ago, the AMPTP wanted to enact profit-based residuals, defer all Internet compensation in favor of a study, forever eliminate "distributor's gross" valuations, and enforce 39 pages of rollbacks to compensation, pension and health benefits, reacquisition, and separated rights. 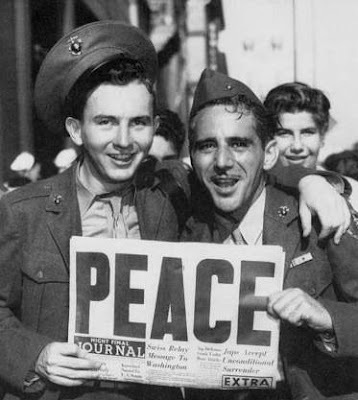 Today, thanks to three months of physical resolve, determination, and perseverance, we have a contract that includes WGA jurisdiction and separated rights in new media, residuals for Internet reuse, enforcement and auditing tools, expansion of fair market value and distributor's gross language, improvements to other traditional elements of the MBA, and no rollbacks. Over these three difficult months, we shut down production of nearly all scripted content in TV and film and had a serious impact on the business of our employers in ways they did not expect and were hard pressed to deflect. Nevertheless, an ongoing struggle against seven, multinational media conglomerates, no matter how successful, is exhausting, taking an enormous personal toll on our members and countless others. As such, we believe that continuing to strike now will not bring sufficient gains to outweigh the potential risks and that the time has come to accept this contract and settle the strike. Much has been achieved, and while this agreement is neither perfect nor perhaps all that we deserve for the countless hours of hard work and sacrifice, our strike has been a success. We activated, engaged, and involved the membership of our Guilds with a solidarity that has never before occurred. We developed a captains system and a communications structure that used the Internet to build bonds within our membership and beyond. We earned the backing of other unions and their members worldwide, the respect of elected leaders and politicians throughout the nation, and the overwhelming support of fans and the general public. Our thanks to all of them, and to the staffs at both Guilds who have worked so long and patiently to help us all. There is much yet to be done and we intend to use all the techniques and relationships we've developed in this strike to make it happen. We must support our brothers and sisters in SAG who, as their contract expires in less than five months, will be facing many of the same challenges we have just endured. We must further pursue new relationships we have established in Washington and in state and local governments so that we can maintain leverage against the consolidated multinational conglomerates with whom we bargain. We must be vigilant in monitoring the deals that are made in new media so that in the years ahead we can enforce and expand our contract. 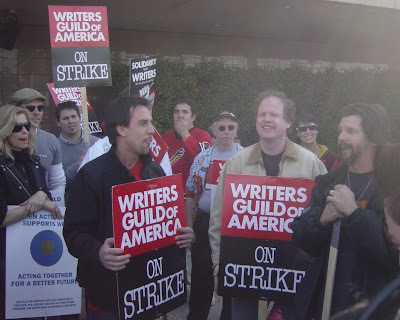 We must fight to get decent working conditions and benefits for writers of reality TV, animation, and any other genre in which writers do not have a WGA contract. Most important, however, is to continue to use the new collective power we have generated for our collective benefit. More than ever, now and beyond, we are all in this together. The next step: meetings today in New York and Los Angeles to present the deal to the WGA membership. Cross your fingers that this is it folks! New York,NY – February 8, 2008 – The wait is finally over for Battlestar Galactica fans. SCI FI’s Emmy and Peabody Award-winning original series returns for its fourth original season on Friday, March 28 @ 10pm ET/PT with two back-to-back half-hour specials. The first new episode will premiere the following week, Friday, April 4 @ 10pm ET/PT. Battlestar Galactica: Revisited (10pm) will serve up the essential information on the series’ past three seasons, providing the uninitiated with an introduction to the characters, relationships and spine-tingling drama that have captured the imagination of audiences around the world. 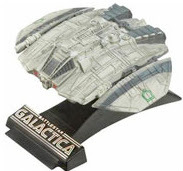 Galactica’s executive producers, Ronald D. Moore and David Eick serve as guides, providing insights and revelations about the critically-acclaimed series. Battlestar Galactica: The Phenomenon (10:30pm) is a celebrity-studded celebration of the show’s impact on pop culture. Interviewees, including Seth Green, country music’s Top Male Vocalist of 2007 Brad Paisley, and Talk Soup’s Joel McHale, and others, wax poetic about why Battlestar Galactica is one of the best frakkin’ shows on television. As season 4 opens, the last remnants of humanity continue their search for a new home, the thin line that separates them from the rapidly evolving Cylons is being redrawn. Galactica’s crew, rocked by Starbuck’s sudden and mysterious return from the dead – and her claims that she has been to Earth and can lead them there – attempts to make sense of the inexplicable. Meanwhile, four members of the fleet are still reeling from the revelation that they are Cylons and have been all along. Battlestar Galactica is the gripping saga of humanity's last remnants and their struggle to find a new home while fleeing from their deadly Cylon enemies. Redefining the space opera with its gritty realism, Galactica’s intensity, issues-driven topicality, and command performances have garnered it numerous awards, including an Emmy and the prestigious George Foster Peabody Award. The show was recognized by the American Film Institute (AFI) as one of the most outstanding programs of the year two years running. The series is from Universal Media Studios and is executive produced by Ronald D. Moore and David Eick. The outstanding ensemble cast is led by Edward James Olmos, Mary McDonnell, Katee Sackhoff, Jamie Bamber, James Callis, Tricia Helfer and Grace Park. Via my livejournalist friend and BSG fan sabaceanbabe, here's a Hey!Nielsen survey where you can show your support for the striking writers and say how your entertainment habits have been effected during the strike. IESB has more photos and reportage from the Sci Fi Channel strike day...does anyone else find it interesting that Joss Whedon was there? Or is it just me? Regardless, it always fills me with happiness when the makers of my favorite stuff totally, like, hang out together. Tee hee. 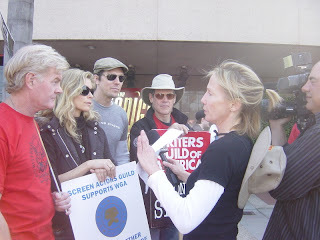 Speaking of folks spotted in these photos - Michael Trucco and Kate Vernon were also on the picket at NBC-Uni that day, as you can see in the IESB shots below. Nice "frakking cylon" shirt, Trucco! 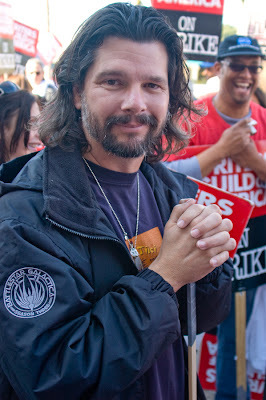 Ron Moore,at NBC with Mark Verheiden in the upper left background. Since no one has actually seen the new contract proposal yet, it's all just speculation at this point. But, the general expectation appears to be that this is wrapping up. Yet, one can't really know what's going on until everyone examines the deal in detail. Meanwhile, it was Sci-Fi Channel Day at NBC in Burbank on Wednesday, and Mark Verheiden and Charlie Craig of Eureka along with Ron Moore and Joss Whedon were all attending. Ron Moore, WGA organizer, as the AMPTP refers to writers. For you Michelle "Admiral Cain" Forbes fans out there, her new series IN TREATMENT on HBO began last week. Forbes plays Kate, the wife of therapist Paul (Gabriel Byrne). Kate's first appearance was on the sixth episode (Monday Feb 4; thanks meshel73! ), and according to Mo Ryan, she has a huge scene on this Friday's episode in episode 9. I've watched the first 6 eps, and am really enjoying it. HBO is streaming the first 15 eps of IN TREATMENT for free on the show's site, as well as giving them away on iTunes. Michael Trucco's official site has just been redesigned and looks pretty darned snazzy. Leah Cairns unveiled her new official site this month. Apparently her webmaster is planning a fanart gallery (submissions welcome), as well as a regular podcast to allow Leah to answer fan questions. Cool beans! SF Universe gives a heads up that Tricia Helfer will be attending the 7:45pm screening of her new film SPIRAL this Friday night in Los Angeles. When I look back at my childhood, when I think back to the days growing up on the farm, I find myself smiling. I was instilled with an appreciation and admiration for the land, family and honor. My goal is to build a house that respects the land in it's entirety. To live in comfort while respecting the very view that I build my deck to overlook. Congratulations to Galactica Sitrep readers Kim Kinsella and Chris Oldaker for winning Chief Tyrol figures from Diamond Select Toys & Collectables signed by actor Aaron Douglas. Thanks to everyone who entered, and we plan to have more contests in the future with the awesome folks at Diamond Select. Deadline Hollywood Daily has the latest insider news on the state of the WGA strike. The WGA leadership is gathering together the membership this weekend to discuss any possible agreement. So, it looks like picketing will continue, at the very least for the rest of this week, along with several benefits and events, including Sci-Fi Channel day for fans and writers at NBC in Burbank, California. Cap Six and Tigh?!? Now THAT is a plot bunny that I can sink my teeth into. Love it.